Carols for Choirs is a collection of vocal scores, predominantly of Christmas carols and hymns, first published in 1961 by Oxford University Press. 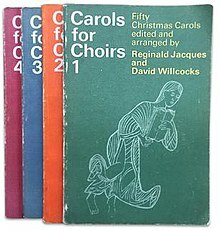 It was edited by Sir David Willcocks and Reginald Jacques, and is a widely used source of carols in the British Anglican tradition and among British choral societies. A second volume was published in 1970, edited by David Willcocks and John Rutter, and the collection is now available in five volumes. A compendium edition was published later. In addition to music for Christmas, the collection also offers works that are suitable for other Christian festivals such as Advent and Epiphany. The books contain the most commonly performed carols and their harmony arrangements, with descants from the editors (mainly Willcocks) which have become the de facto standard descants for these tunes in the Anglican communion in the UK. Most of the arrangements were originally written for use by the Choir of King's College, Cambridge or the Bach Choir in London. Carols For Choirs was originally launched by the organist and music editor at Oxford University Press Christopher Morris. Whilst working at St George's, Hanover Square, he realised that church choirs lacked a definitive book of Christmas carols, and felt that a single book would be more convenient than using separate pieces of sheet music and hymn books. Under his direction, the first book of Carols for Choirs was commissioned. To edit the collection, Morris enlisted David Willcocks, Director of Music at King's College, Cambridge, and Reginald Jacques, conductor of the Bach Choir. The book was published in 1961, containing new arrangements of traditional carols, but it also popularised pieces by modern composers such as William Walton, Benjamin Britten, Richard Rodney Bennett, William Mathias and John Rutter. Carols for Choirs was an instant success and became OUP Music Department's best-selling title, with over a million copies being sold. OUP were keen to commission a second volume, but after the death of Jacques in 1969, a new editor had to be found to support Willcocks, and an undergraduate at Cambridge University, John Rutter, was recruited. Carols for Choirs 2 was published in 1970. 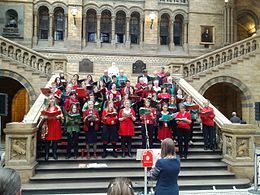 The books in the Carols For Choirs collection came to be regarded as standard choral texts throughout the English-speaking world and were highly influential; according to the composer John Rutter, they "changed the whole sound of Christmas for everybody who sings". Choir singers usually refer to the books by the colours of their covers, with the "green" and "orange" books (volumes 1 and 2) being the most widely used. The "blue" book (volume 3) contains a number of longer anthems, and the "red" book features fifty carols arranged for sopranos and altos. In July 2011, Oxford University Press published the fifth incarnation of the original series, Carols for Choirs 5, edited by composer Bob Chilcott, to celebrate the 50th anniversary of the publication of the first volume. Jacques, Reginald; Willcocks, David, eds. (24 August 1961). Carols for Choirs 1: Fifty Christmas Carols. OUP. ISBN 9780193532229. Willcocks, David; Rutter, John, eds. (16 July 1970). Carols for Choirs 2: Fifty Carols for Christmas and Advent. Oxford: OUP. ISBN 9780193535657. Willcocks, David; Rutter, John, eds. (7 September 1978). Carols for Choirs 3: Fifty Christmas Carols. Oxford: OUP. ISBN 9780193535701. Willcocks, David; Rutter, John, eds. (21 August 1980). Carols for Choirs 4: Fifty Carols for Sopranos and Altos. London: OUP. ISBN 9780193535732. Chilcott, Bob; Blackwell, David, eds. (2011). Carols for Choirs 5: Fifty Christmas Carols. Oxford: OUP. ISBN 9780193373563. Compendium Edition: Rutter, John; Willcocks, David, eds. (1987). 100 Carols for Choirs. Oxford: OUP. ISBN 9780193532274. Archer, Malcolm; Cleobury, Stephen, eds. (6 April 2000). Advent for Choirs. Oxford: OUP. ISBN 978-0-19-353025-6. Archer, Malcolm; Scott, John, eds. (2004). Epiphany to All Saints for Choirs: Anthems for the Church's Seasons. Oxford: OUP. ISBN 978-0-19-353026-3. Scott, John; Dakers, Lionel, eds. (1998). Ash Wednesday to Easter for Choirs. London: OUP. ISBN 9780193531116. ^ a b c Bannister, Matthew (21 December 2014). "Christopher Morris Obituary". Last Word. 25 minutes in. BBC. BBC Radio 4. Retrieved 4 October 2016. ^ a b Beeson, Trevor (2009). "17. The Oxbridge Choirs". In Tuneful Accord : the church musicians. London: SCM. p. 141. ISBN 9780334041931. ^ a b "Christopher Morris, musician - obituary". Daily Telegraph. Retrieved 4 October 2016. ^ Senior, Evan, ed. (1978). "Carols for Choirs 3". Music and Musicians. Hansom Books. 27: 25. ^ "Reviews". Brio. International Association of Music Libraries, United Kingdom Branch. 43 (1). 2006. ^ a b "…for Choirs Collections". Choral Series. Oxford University Press. Archived from the original on 5 October 2016. Retrieved 5 October 2016. Obituary of Christopher Morris, the organist and publisher who launched the book Carols For Choirs.